Women are strong. Women are motivated. Women are passionate. Let's face it...women are total badasses and so many powerful and purposeful women are living their lives with great enthusiasm every single day. And thankfully, we aren't stopping anytime soon! As I close the chapter of my life in Portland, Oregon, I wanted to take the time to sit down and chat with some of the fabulous Gusto-driven women that I've had the pleasure to meet, get to know, and make dreams a reality with over the last several years. I hope that their beautiful paths to purpose can inspire you to follow yours and to not settle until you too, are living the life you dream of and deserve. Today, I'm SO excited to highlight some insights from Maryam Behrouzi, founder of Spela Cosmetics. Maryam is powerhouse entrepreneur who has found a beautiful balance between business ambition and boundaries of wellbeing. 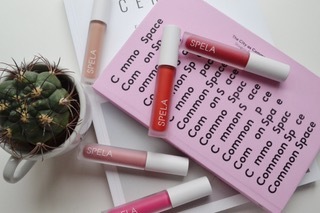 Her company, Spela Cosmetics, provides beauty connoisseurs with vegan, non-toxic, cruelty-free, and sustainably-minded products made in the USA and EU compliant. Their gorgeous lip colors are any YouTube guru's dream...and their mindful ethics make them a true 21st century knockout biz. Stay tuned for the launch of their first non-toxic nail polish line coming this June! She's motivated by true passion for what she does. She has found a beautiful balance between the demands of entrepreneurship and the importance of self-care. She is truly professional while remaining fun and open to real connection. She realizes the importance of living life to the fullest and following dreams not for financial gain, but for living a happy life. She has created a business that stays true to her personal ethics and values while embracing fun and fashion. She has worked to transform her own creative outlet into a passion project and further, into a real sustainable business. She embraces the challenge of wearing many hats as an entrepreneur with grace and patience. She understands her unique strengths and has leveraged them to grow her business and find personal fulfillment. She keeps a positive eye toward the future while remaining grateful for where she is now and how far she has come. As is the truth for many of us, Maryam's path wasn't always clear. She actually studied law and was a practicing lawyer before realizing that if she wanted to start a business, it was now or never. She was happy, but realized that law wasn't something she could see herself continuing to love for the rest of her life. As a child, she spent time learning from her parents as they navigated starting and operating their own business. Her family left Iran as political refugees when she was 3 years old and had the drive to manifest their own version of their future. You can see this fire perpetuated in the way Maryam thinks about and runs her own company today. One beautiful sentiment (of many!) that Maryam shared with me is that she believes purpose can change. She says, "It's really about where you are at a specific time and place in your life and what serves you. All of the interests that you have and how you want to channel those will fluctuate throughout your life." I found this idea SO moving because many of us spend our entire lives trying to find our ONE, TRUE PURPOSE. But maybe that is a fantasy. Maybe there is no one true purpose for any of us. Maybe it changes. And if so, why do we continue to place so much pressure on ourselves to find it? What a beautiful thought! Let's release the pressure we have to identify our purpose and spend more time following what feels good right now...what our purpose is right now, at this point in our lives. And know that it can, and probably will, change, and that's completely okay. She says that right now, "Being an entrepreneur is just exactly what I need to be doing. It feels very right. It's very challenging at times but it's very satisfying...I love that you are building something out of nothing. There's no road map, there's a lot of figuring it out as you go. It's super exciting." Maryam mentions a similar idea when it comes to the concept of flow. She says that her idea of flow and her tasks where she feels most in flow change from day to day. "It really depends on the day. Some days I just feel really on it and everything is easy. I'm focused, I'm doing things, but it really depends on the day. There are times when accounting and bookkeeping is the absolute worst and other days, I get into a groove and it's easy, effortless, exciting!" This is another extremely freeing idea! We put pressure on ourselves to be perfect every single day and to always be interested in what we think we "should" be interested in at each moment...but maybe that is unrealistic. Every day is different. We are different, our environments are different, our companionship is different and so, why wouldn't our flow state fluctuate and be different as well? Release the pressure. Find what feels good in each individual moment. Some days are easy, some days are really hard! And that's okay. "Be a little bit gracious with yourself. If you're having a slow day, that's okay too." When asked what tips or lessons she has learned throughout her experience as an entrepreneur that she thinks others would find helpful, Maryam said, "Just do it." It's a simple as that. She says, "You'll never be 100% certain about ANY decision, so just make a decision." It's all part of the game. To live a life of passion and gusto, there is going to be a little risk. It might seem terrifying at times, but the reward is SURELY worth the risk. "You can easily get into a rut of decision fatigue and over thinking things and double guessing but it just keeps you from acting." Nothing is ever certain as an entrepreneur...but that is the seed of growth and excitement! Being an entrepreneur is also about leveraging your own talents and tendencies in a way that works for moving your business forward. Maryam explained how she has found a balance between her analytical self, with her law background, and her creative self, with her extroversion traits, that is really beneficial to how her business operates. Each day is different and she gets to use both sides of her brains for different tasks and projects, which leads her to feel optimally fulfilled in her work. An ode to the multipotentialite framework created by the amazing Emilie Wapnick. As for the future of Spela, Maryam has beautiful goals. She is working really hard right now to expand the line with her new nail polish and some other amazing products coming out later this year. She dreams of having a big office space filled with employees who do engaging, specialized work to move the business forward. "I love the idea of having a team where people are allow to really pursue passions." She says thus far, she has been forced to focus mainly on the "essentials" of running a business but she is excited to expand and focus on those "nonessentials" that are also extremely valuable....such as education. "I want to provide a source of concise, easy to digest information about the products customers choose to use and why they are formulated the way they are." Maryam also explains that there is a great deal of work to be done to increase cosmetics regulations in the US (the EU currently bans over 1,300 known harmful chemicals and the US FDA has only banned 11 of them!) as well as banning animal testing for cosmetics. Spela is dedicated to not only providing ethical products but also working to spread their ethical policy education to a greater audience. On a personal note, Maryam is working to experiment with identifying a routine that works best for her. She is a new dog mom (to the seriously adorable Frenchie pup, Leon) which has caused her to realize that a more structured routine might be a great idea both for him and for her business. She has been doing the Fitlandia 30 Days to Thriving wellness program as well as exercising and meditating every morning...and guess what? She feels SO much more focused and productive throughout the day when she does so. What wellness habits would help move YOU forward? One detail I found extremely compelling about Maryam's lifestyle is the permission she gives herself to take time away. She knows the importance of self-care and spending time connecting with her partner or others...away from work. She says, "I almost feel guilty sometimes because I think a lot of people work harder than I do, but I take a lot of time to cook and spend quality time with my husband. I think those things are important." That balance and continued reminder of what is truly important is something I find so beautiful and truly inspirational! We can all work to emulate this balance and to fuel our work with a fueled self. I want to say a huge THANK YOU to Maryam for taking the time to sit down and chat with me about her passions and her experiences. I am humbled to have met such an amazing woman who truly follows her fluid purpose, knows her values, and lives them with great enthusiasm each day. A true Woman with GUSTO, to be sure. Follow Spela for updates on their upcoming products and more! To all the women out there...you too, are a woman with GUSTO! Let your inner passion shine. I hope these features help bring about ideas and inspiration for moving forward toward your own best life.